With newfangled technology like cell-phone photography and Internet bloggery, the course of human events is entering a new epoch, a networking guru informs us. 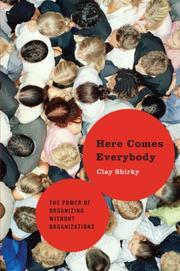 Today, active groups can form where such formations were once impossible, declares Shirky (Interactive Telecommunications Group/NYU). Such modern configurations of power based on the free exchange of information can change society. So toss out all those old organization charts: The Internet, according to the author’s facts, figures and theories, offers organization without management, networking without hierarchy. There is no institutional overhead, no cost in failure. Now we can publish before editing, Wikipedia being the prime example. In this new modality, victims of an abusive priest find redress together, stay-at-home moms consult communally, networking terrorists plot evil and anorexic teens confer on ways to starve. Collective action is almost effortless, and evanescent flash-mob events are easy to organize, often to the consternation of authorities. Viral networking can spread like the flu, distant conversation is as simple as pecking on a keyboard and everyone can be a journalist, a publisher, an encyclopedia editor. Shirky, with his illustrative anecdotes, provides back stories for latter-day groupies who log onto Flickr, Meetup, Groklaw and those sometimes fleeting wikis. He clearly applies the theories of power-law distribution and collective action, though as the discussion turns to Coasean Theory or the thoughts of Vilfredo Pareto it leans a bit toward the didactic. All that’s needed, says the author, is the promise of a useful outcome, appropriate tools and agreement of participants to afford a platform for networking groups, like Archimedes, to move the world. Some wise observations amidst a predominantly old-news text.